I had been meaning to get to the FOAM for months now to see the Diane Arbus exhibit there. Today we finally made it. We got there early before it got busy, which is good. The FOAM is small with lots of hallways taking you from one small room to the next and I imagine if it’s crowded it wouldn’t be much fun. I hate having to negotiate space with people in order to see things on walls. If you want to see this exhibit, hurry, it ends 14 January. There are not only photos taken by Dian Arbus, but what I found really interesting was the section about her life, how she became a photographer, what cameras she used, who hired her and what media she was involved with. What DB and I both found curious about the photos chosen for the exhibit is that they were all so somber. Looking at the books in the shop later, and looking at her original proof sheets on display, she had a lot of photos of happy looking people. For some reason, whoever chose these particular photos to hang on the walls, didn’t use them. No happy people allowed. Curious. Like all highly acclaimed artists, she makes her art look easy. If you didn’t know better you’d come away thinking “well, I could have taken those photos”. Well, no you couldn’t. Look at how she used light. Look how she used contrast. What has she chosen to include, and more importantly exclude, in the picture frame. That takes an eye that nearly everyone else doesn’t have. When you look at the cameras she used it is even more amazing that she got those shots. Even with all our fancy camera equipment available these days, that is fairly affordable, we take snapshots that no one will look twice at. And I won’t even start about Instagram, something I really hate…. Looking at her first Nikon on display I had a momentary longing for my first 35mm camera, a Pentax with a 50mm lens. Totally manual. I took B&W film and developed the negatives and made prints in the darkroom at school. It would take me days, even weeks, to come up with something I liked and would show anyone else. A far cry from our instant everything digital world. Going to this exhibit was inspiring for me. If nothing else, it made me realize again that I need to carry my camera with me at all times. Using my iPhone camera is just plain laziness. Oh, btw, after the FOAM, we had lunch at an Irish pub. 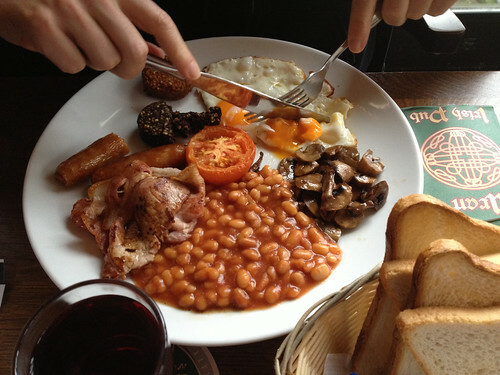 We pretended to be tourists and had the full Irish breakfast. Then we went to Soap and had hour long massages. It was indeed a self indulgent day.